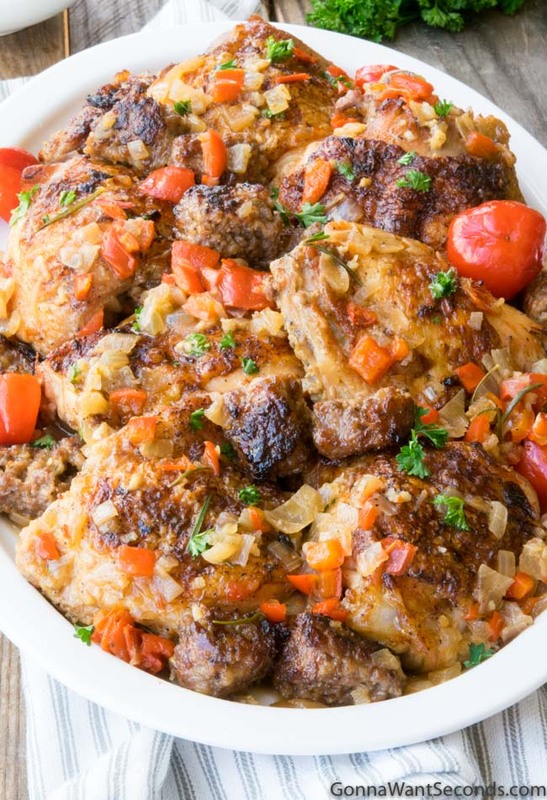 A classic Italian-American dish, Chicken Scarpariello transforms simple chicken thighs into a delicious dinner with a sauce so dazzling you’ll be scraping your plate to get every last drop! Doesn’t “Chicken Scarpariello” sound like a dish straight out of the Godfather movies? Italian practically oozes from the title like mozzarella on a hot slice of pizza. It’s a dish that definitely does not disappoint for all you Italian-food lovers out there! Scarpariello comes from the word scarparo, which means shoemaker or cobbler in Italian. “Shoemaker Chicken” just doesn’t have same, uh, ring to it, though, so you’ll find it referred to in the Italian-style on menus here in the U.S. where thankfully most of us don’t know enough Italian to associate this dish with feet. Shoemaker-style chicken is likely an Italian-American dish, rather than one adopted directly from their European homeland, but the origin of the name is still a bit of a mystery. Some stories attribute the name to the resourcefulness of shoemakers and its similarity to the creative use of ingredients in this dish. Others focus on how quickly this dish comes together, something a busy shoemaker could prepare in a short amount of time after a long day in the cobbler shop. Pin it to your CHICKEN BOARD to save for later! 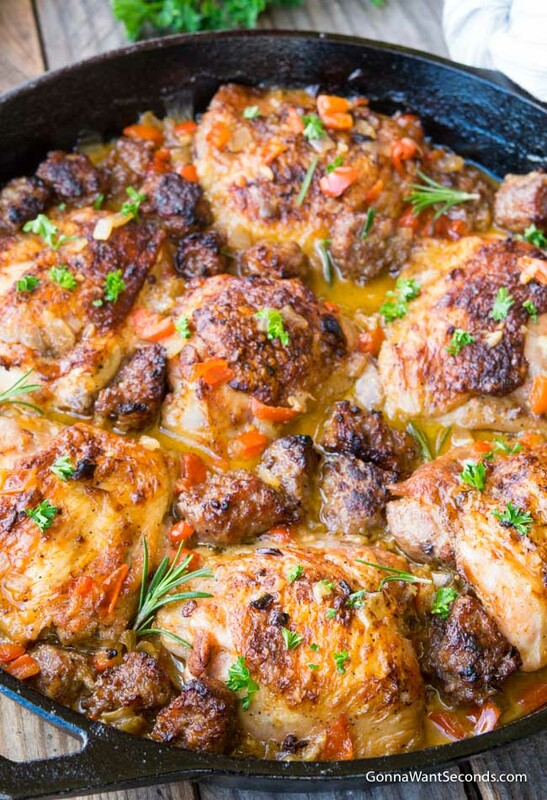 Chicken Scarpariello is a braised chicken dish which produces the heavenly, to-die-for Scarpariello sauce that makes this such an unforgettable meal. Although it’s not a cream-based sauce, like I use in my Chicken Florentine, it has a creamy consistency that’s just as addictive! You’ll usually find plenty of peppers, some vinegar to increase the acidity of the sauce, and lots of garlic. Some recipes make chicken Scarpariello with sausage while others (like the chicken Scarpariello Giada de Laurentiis makes) use prosciutto. The dish is often served with crispy, roasted potatoes on the side (probably because they’re so good at absorbing the amazing sauce). This may sound like another dish you’ve heard of – chicken pizzaiola, but tomatoes, that ripe, red fruit that’s practically synonymous with Italian cuisine, is lacking from Chicken Scarpariello. Chicken pizzaiola, which is basically a pizza in a skillet, has a hearty tomato sauce, as well as a generous sprinkling of cheese on top. There’s no cheese in Chicken Scarpariello either. WHAT IS A SCALLOPINI OF CHICKEN? Those are the thin, boneless chicken breast cutlets that cook in a flash, but they don’t work as well as the bone-in thighs in this dish. Some recipes, like the chicken Scarpariello Rachael Ray version, use cut up chunks of boneless chicken breasts, which cook up almost as fast as the scallopini, but you’ll find there’s so much more flavor in the thighs. 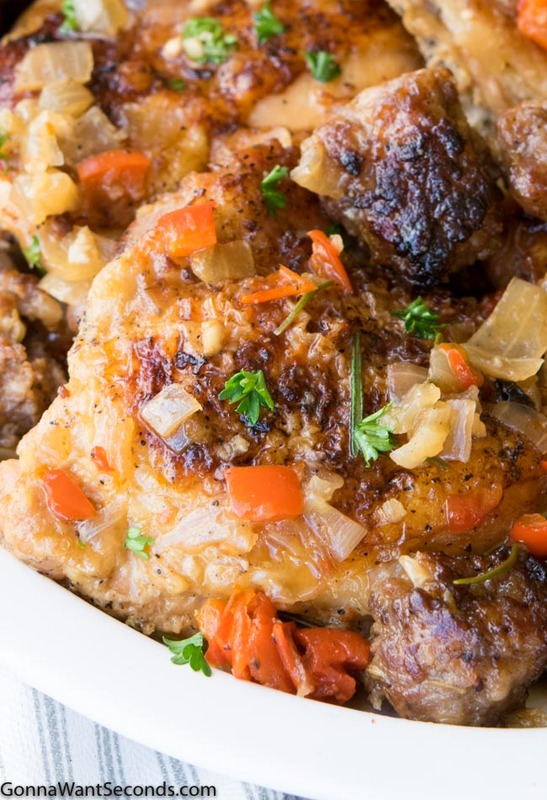 Although the Chicken Scarpariello cooks pretty quickly, there’s still some breakdown of the bones and connective tissue in the thighs that help enrich the sauce. 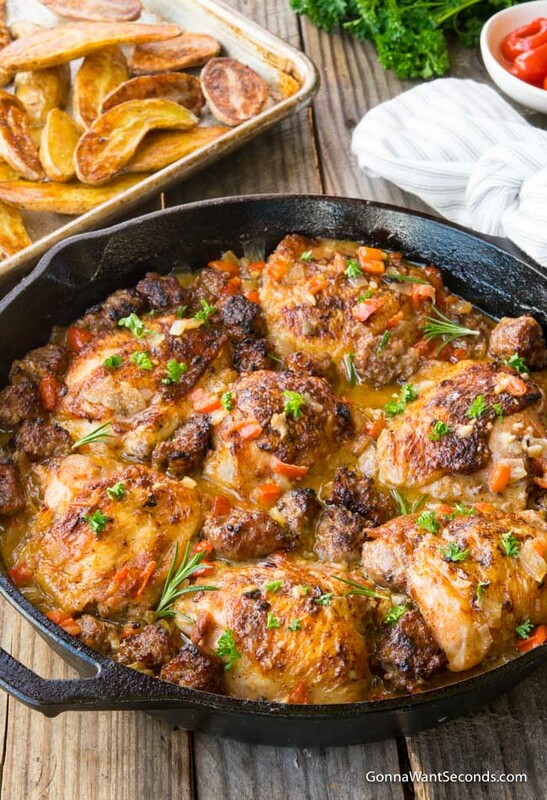 Unlike other classic Italian-American dishes like Chicken Vesuvio which is almost always made with a whole cut-up chicken, the cut used in this dish will vary based on whose mama’s doing the cookin’. The chicken Scarpariello Lidia Bastianich makes is a boneless chicken Scarpariello with sausage that uses thighs only. The chicken Scarpariello Anne Burrell makes starts with a whole, bone-in chicken cut into the standard eight pieces. Of course, there’s also the legendary chicken Scarpariello Carmines in New York City serves that uses chicken wings. I think Buffalo wings might have a serious competitor! 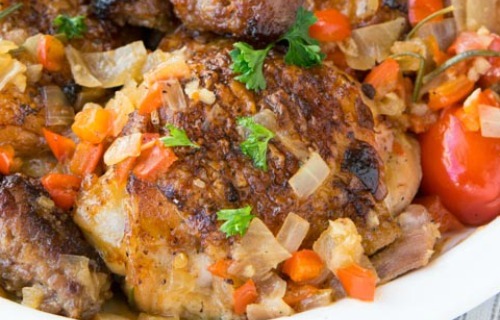 I LOVE this version of Chicken Scarpariello, though, since the bone-in thighs really pack the most flavor, and you don’t have to worry about different pieces cooking at different times. The first step is roasting the potatoes. Some recipes call for roasting these in the same pan as the chicken, but they just don’t get the same crispy exterior. Fingerling potatoes are also the way to go here since their small size and firm texture are ideal for this cooking method. They cook fast but hold their shape well when you start dragging them through the sauce on your plate. While those are roasting away in the oven, you can start the rest of this dish on the stovetop. You’ll brown the seasoned chicken thighs in a hot pan first. Just remember not to season them too far ahead of time or else you’ll have some extra moisture to deal with (and remember hot oil plus water equals pain and a messy stovetop). If you don’t have a cast iron skillet, a high-sided, oven-safe skillet will work just fine. Next, we’ll brown the Italian sausage in the same pan. This recipe calls for a sweet Italian sausage, which is essentially just the mild version of hot Italian sausage. Some “sweet” versions have a little basil in them, as well as the traditional flavors of fennel and garlic. Since these are raw, not smoked, sausages, you can just split the casings open on the side and easily remove the sausage filling. Depending on your market, you may even be able to buy it in bulk without the casings at all. Next, come the aromatics (garlic and onion) and the peppers. The red bell works great in this dish for the obvious pop of color but also because red peppers are more subtly sweet than their green counterparts. These ingredients will saute slowly, caramelizing and deepening the flavors for this killer sauce. All the browned bits from the pan will get incorporated too, after deglazing with white wine and a little chicken stock. To balance the sweetness, we’ll incorporate a little acid in the form of white wine vinegar and perky Peppadew peppers. These slightly spicy, bright red beauties (which I use in my Tortellini Salad too) are brined, so they add their own touch of vinegar, along with a little bit of heat. They’re also called cherry peppers (which is what the chicken Scarpariello Serious Eats version calls for). If you really want to up the heat in this dish, you can substitute cayenne or serranoes, which you’ll find in the chicken Scarpariello recipe Mario Batali version, but that’ll likely remove from it from your family-friendly meal options! The herb of choice for this sauce is rosemary which is strong enough to stand out in all this richness and a nice earthy complement to the chicken and other ingredients (especially the Italian sausage). Rosemary is a woody herb, and the leaves, even when chopped, can stay pretty tough and noticeable in your dish. I like to use the “bay leaves” trick of floating a few sprigs of rosemary in the sauce to impart the rosemary flavor in a way that still allows you to fish out most of the leaves before serving. The Chicken Scarpariello gets finished in the oven, which allows the sauce to slowly thicken and the chicken to get up to temp. Using the oven allows the chicken to cook more evenly than it would with the direct, one-sided heat from the stovetop. Chicken Scarpariello is elegant enough for a special occasion but works just as well for a weeknight treat. Although it’s basically a complete meal if you have a veggie on the side, you’ll definitely want some crusty bread to dunk in the leftover sauce! No skillet, no problem – If you don’t have an oven-safe skillet, you can use an oven-proof baking dish to finish this recipe. I just recommend preheating the dish in the oven a bit before pouring your sauce into it, adding your chicken, etc. Otherwise, you may need to add some additional cooking time for the chicken to reach 165 degrees. Side suggestions – If you want to skip the roasted potatoes, you can serve this dish with some cheesy polenta instead or just skip them both if you’re cutting carbs. Some roasted veggies – like Brussel sprouts, broccoli, or your favorite vegetable blend, would work just as well. A classic Italian-American dish, Chicken Scarpariello transforms simple chicken into a delicious dinner with a sauce so dazzling you’ll be scraping your plate to get every last drop! Make the Potatoes; Adjust 2 oven racks to the upper and lower thirds position and preheat it to 450 degrees. On a rimmed baking sheet, toss the cut potatoes with 2-3 tablespoons of olive oil then generously season them with salt and pepper. Arrange potatoes cut side down on the baking sheet. Roast in preheated oven, on the lower rack, until browned and tender, about 20-30 minutes. Meanwhile, make the chicken; Pat chicken pieces dry with paper towels. Season the chicken generously with salt and pepper. Heat 2 tablespoons olive oil in a large cast iron skillet over medium heat. When it begins to shimmer, add the chicken, skin side down and cook without moving until well browned about 3-5 minutes. Turn the chicken over and brown on the other side, adjusting the heat as needed, about 3 minutes. Remove chicken to a plate and set aside. Leave oil in the skillet. Add sausage to skillet and cook over medium heat, breaking it up into 1/2 inch pieces, until its browned, about 3 minutes. Remove sausage to a paper towel-lined plate and set aside. Remove skillet from heat and pour off all but 2 tablespoons of fat. Return the skillet to medium heat and add the onions, red bell pepper, and garlic and cook, stirring occasionally, scraping up any brown bits on the bottom of the pan, until the vegetables are soft, 10-12 minutes. Add the wine and continue to cook, stirring occasionally, until most of the wine has evaporated about 8 minutes. Add broth, Peppadews, vinegar, and rosemary and bring to a boil. Reduce heat and vigorously simmer until slightly reduced about 5 minutes. Add chicken back to skillet, along with any accumulated juices, and nestle pieces into onion mixture. Place uncovered in preheated oven for 10 minutes. Add sausage to pan, pushing them down into onion mixture and continue to roast until chicken is cooked through, about 5-10 minutes and an instant-read thermometer inserted into the thickest part of the chicken reads 165 degrees.